Mix mango pulp and yoghurt in a blender until reaching a smooth consistency. Add honey, lemon zest and lemon juice. Mix again. Place the cake shells in a tray and stuff with the mango mix. Garnish with little balls of mango, blackberries and fresh mint. Serve immediately. Use a special cutter to cut little mango balls. This is quite an easy dessert; your kids can help or you can even place the ingredients on the table and let your family create their own version. Mango is one of my favorite tropical fruits. It’s a versatile option for sweet or savory recipes. Among the diverse types of mangoes out there, I love champaña, manila or ataulfo mangoes, native to different Mexican states like Michoacán, Sinaloa, Nayarit, Jalisco, Veracruz and Chiapas. These are in season from March to September. 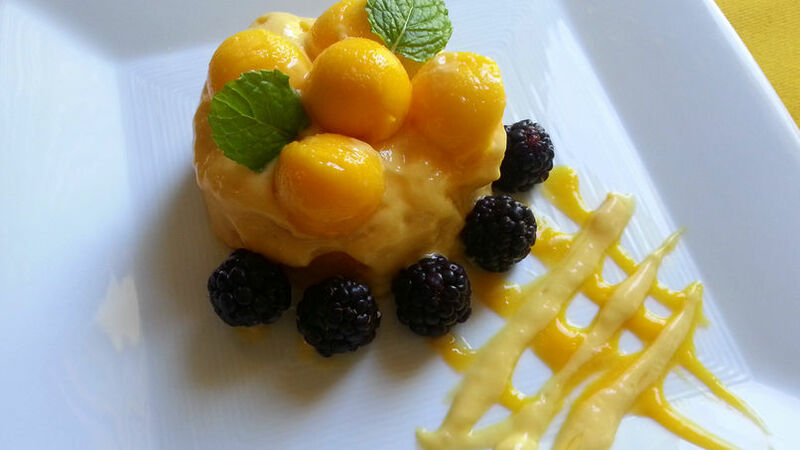 Let’s celebrate this deliciuous fruit with an easy-to-make mango tartlet. It’s mango time!